This airticle is aboot a urban aurie in Hong Kong. For ither uisses, see Kowloon (disambiguation). "Kowloon" is a transliteration o 九龍. For ither transliterations, see 九龍 (disambiguation). Kowloon (/ˌkaʊˈluːn/; tradeetional Cheenese: 九龍; jyutping: gau2lung4;hakka: giu3lung2) is an urban aurie in Hong Kong comprisin the Kowloon Peninsula an New Kowloon. It is bordered bi the Lei Yue Mun strait in the east, Mei Foo Sun Chuen an Stonecutter's Island in the wast, the muntain range includin Tate's Cairn an Lion Rock in the north, an Victoria Harbour in the sooth. It haed a population o 2,019,533 an a population densitie o 43,033/km2 in 2006. Kowloon is locatit north o Hong Kong Island an sooth o the mainland pairt o the New Territories. The peninsula's aurie is approximately 47 km2 or 18.1 mi2. Thegither wi Hong Kong Island, it contains 48 percent o Hong Kong's total population. 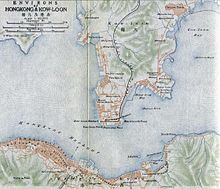 The seestematic transcription Kau Lung or Kau-lung wis aften uised in derivit place names afore Warld War II, for example Kau-lung Bay insteid o Kowloon Bay. Ither spellins include Kauloong an Kawloong. The name Kowloon stems frae the nine draigons, a term which refers tae aicht muntains an a Cheenese emperor: Kowloon Peak, Tung Shan, Tate's Cairn, Temple Hill, Unicorn Ridge, Lion Rock, Beacon Hill, Crow's Nest an Emperor Bing (Song Dynasty). The pairt o Kowloon sooth o Boundary Street, thegither wi Stonecutters Island, wis cedit bi Qing Cheenae tae the Unitit Kinrick unner the Convention o Peking o 1860. For mony years the aurie remained lairgely undevelopit, uised bi the Breetish mainly for teeger-huntin expeditions. The pairt o Kowloon north o Boundary Street (New Kowloon) wis leased bi the Breetish as pairt o the New Territories in 1898 for 99 years. Athin New Kowloon is Kowloon City, which refers tae an aurie whaur the Kowloon Walled City uised tae be locatit. The Kowloon Walled City itsel wis demolisht in 1993. The same aurie wis cried 官富場 (Pinyin: Guanfuchang) durin the Song Dynasty. Statutorily, "Kowloon" is uised tae refer tae the aurie sooth o Boundary Street an the Stonecutters Island. "New Kowloon" haes remained pairt o the New Territories an aw. In modren day cultur, housomeivver, New Kowloon is aften no regardit as pairt o the New Territories, but as an integral pairt o the Kowloon urban aurie on baith sides o Boundary Street. For tax purposes, New Kowloon is no considered pairt o Kowloon an is pairt o the New Territories, as is reflectit in the statutes. Properties in New Kowloon are subject tae payment o laund leases, as in the New Territories. Lairge-scale development o Kowloon began in the early 20t century, wi the construction o the Kowloon-Canton Railway an the Kowloon Wharf, but acause o Kowloon's close proximity tae Kai Tak Airport, biggin construction wis limitit bi flicht paths. As a result, compared tae Hong Kong Island, Kowloon haes a hintle lawer skyline. Efter Warld War II, Kowloon became extremely congestit when slums for refugees frae the newly established Fowkrepublic o Cheenae gave wey tae public hoosin estates, mixed wi private residential, commercial an industrial auries. West Kowloon wis ance hame tae a dockyard for the Ryal Navy. The aurie haes been reclaimit an is nou the steid o several developments. Kowloon East includes Wong Tai Sin an Kwun Tong. Kowloon West includes Yau Tsim Mong, Sham Shui Po an Kowloon City. Kowloon side panorama taken frae Hong Kong Island. ↑ "Kowloon Ferry Station, Hong Kong." (photo). University of Washington Libraries. Accessed June 2011. This page wis last eeditit on 20 August 2013, at 23:00.